What you’ll find at our Applegate Valley winery tasting room are wines as compelling as the views. Our Troon tasting room team could not be more friendly and passionate about our wines and sharing them with you is their pleasure. Surrounding our tasting room our beautiful lawn and gardens are perfect for picnics or just sipping a glass of our wine as you soak in the natural beauty of the Applegate Valley. We are centrally located between Grants Pass, Medford and Jacksonville and just a half-hour drive from I 5. 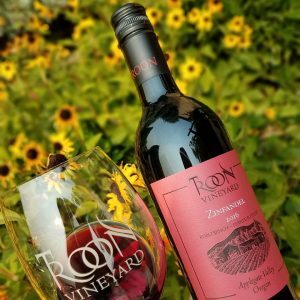 It would be hard to imagine a more perfect day than packing a picnic and visiting Troon and our neighboring wineries in the Applegate Valley. We are fortunate to have discovered such a distinctive terroir for making some of today’s most exciting varieties including vermentino, roussanne, marsanne, tannat, malbec, syrah, sangiovese and tempranillo. A trip to Applegate Valley will open your eyes to an exciting new AVA, varieties on the cutting edge of the fine wine scene and a winery committed to natural winemaking, sustainable agriculture and to taking the Applegate Valley to the forefront of the world of wine.